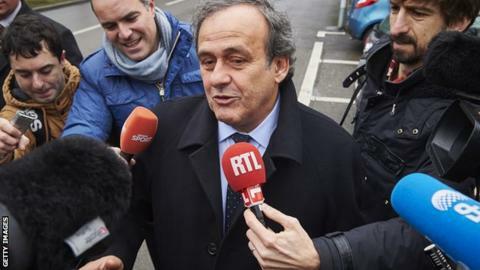 Suspended Uefa president Michel Platini arrived at his appeal hearing on Monday saying he is fighting not for his future but "against injustice". Platini, 60, was banned for eight years by the world governing body's ethics committee in December, as was 79-year-old president Sepp Blatter. Both were found guilty of breaches surrounding a £1.3m ($2m) "disloyal payment" to Platini. "I've done nothing and I'm not afraid of anything," said the Frenchman. "If I had anything to reproach myself for, I would be hiding in Siberia in shame." Blatter's appeal against his ban was heard on Tuesday. Like Platini, the Swiss denies any wrongdoing. According to news agency Reuters, Blatter arrived at 07:30 local time in order to avoid cameramen and photographers who had expected him to arrive later. The verdict could arrive later this week. "Is it Blatter who put me in this situation? Not at all, he is in the same situation as me," added Platini. "Someone pushed the button and I will try to find out who." Uefa said last month that it will not hold an election for its presidency until Platini's appeals process has been concluded. The Fifa appeals committee, which is chaired by Bermuda Football Association president Larry Mussenden, has the power to reduce, increase or overturn the ban. Meanwhile, Greg Dyke has denied that the Football Association has agreed to vote for Uefa general secretary Gianni Infantino in the forthcoming election for Fifa president, to be held on 26 February. Infantino, who joined Uefa in 2000 and has been general secretary since 2009, entered the presidential race in October last year. FA chairman Dyke, speaking to the BBC's Victoria Derbyshire programme, said that the organisation had come under significant pressure to vote for Infantino at a recent Uefa meeting, but added that no decision has been taken. "We're going to discuss this at the FA board this week and the board will decide," he said. "I went to the meeting at Uefa and we refused. We said: 'We are not telling you.' We came under a lot of pressure. There was a lot of pressure. There were half-a-dozen European nations who said: 'We're not deciding today.'" Richard Conway, the BBC's sports news correspondent, says that Infantino is confident of victory. Conway said: "I understand Infantino believes he has secured over the half of the votes from the potentially crucial Concacaf region - 35 votes in total, drawn from North America, Central America and the Caribbean. "Infantino's camp are growing in confidence and believe he has real momentum entering last two weeks of the Fifa campaign. "It is understood that he has secured support from every Fifa region to the extent he now believes he is the frontrunner."